Writer Rick Remender has really started something very fresh with his current Punisher story arc, "FrankenCastle." Yes, the combination of his name, Frank Castle, and the addition of the "en" create a tale which is pretty clear: Frank Castle becomes Frankenstien...sort of. 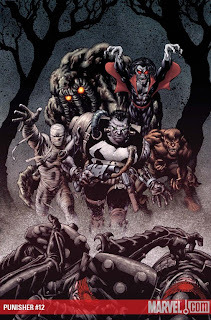 Remender assembles the Marvel Legion of Monsters into one misunderstood group of...well, good guys. After Frank Castle is killed and cut to pieces by Daken, Wolverine's son, the monsters put Frank back together and bring him back to life. Frank is covered with scars, bolts, some metal prosthetic and is now a "monster" himself. The monsters take him into their dwellings and treat him as one of their own while Frank just wants to be left alone in his never ending Punisher sadness (dealing with the death of his family...still). In Punisher #12, some of the monsters try to connect with Frank, including a young innocent monster. Frank's story begins to intertwine with the Marvel monsters when Monster Metropolis (yep, the monster's underground city) is attacked. Frank didn't want to get involved in any monster mash, but during the attack Frank's bolts are pushed too far. We are left with a close-up of FrankenCastle's face that tells us next issue...someone will die. The story is written in a serious tone. It isn't goofy or filled with slap-stick moments, but rather it has heart and interests the hell out of me. It's just likable! Adding the beats to Frank's ticker is the art of Tony Moore. His Scottie Young style art adds both character to all of the monster and a bit of fun. The Marvel monsters feel more friendly through Moore's pencils and their mere appearances makes me like their characters more (no pun intended). His Morbius has such a great new look that if he drew a solo Morbius book, I'd buy it. Yeah, a Morbius book...until, you see Moore's design, that will just sound stupid. Punisher #12 is my comic of the day because of the visually creative monsters, the bold story idea, and the name of the arc: FrankenCastle.